Oh dear. I have been volunteered by my husband to construct a birthday cake for one of his friend's daughter's birthday. They are paying for this (so all the more pressure!) 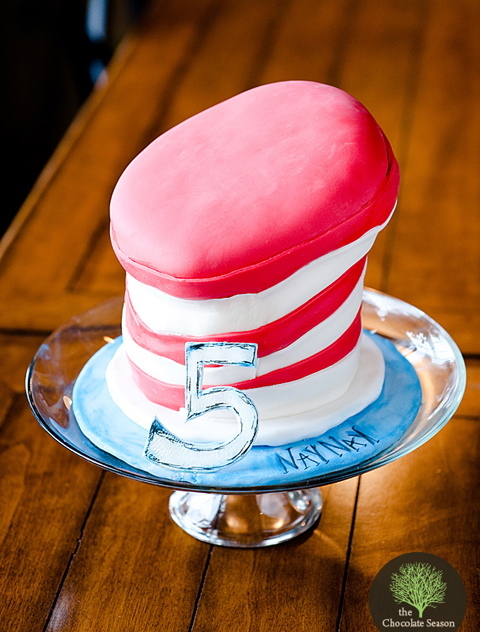 but they wanted a 6-inch cake, stacked, and constructed, into the hat worn by "The Cat" as in "The Cat in the Hat". I'm not very good at posting photos, so i do hope you all know who this storybook character is! But thoughts were bake each cake, put straws in to support each layer, and put a cardboard round under each cake as well. from there...not sure. should i ice each layer then try to carve? or should i carve little niches in it so it looks "floppy"? and then ice the entire thing all stacked and carved? and instead of draping fondant over the whole thing (i don't think i'm that talented!) 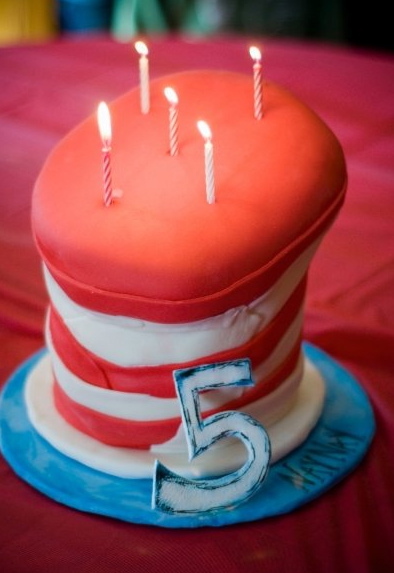 i was going to maybe cut stripes of red and white fondant to make the hat? and ears...um....yeah. and the brim of the hat...should that be a covered cake board used as the base and brim of the hat? oh Lord. what has brad gotten me into?!!! you guys are the best! i know i can count on you!!! It may not be exactly what you're looking for but check out the mad hatter demo thread and it should give you a good start. I have not done many carved cakes, but those I have done were stacked, carved, then frosted, in that order. In looking at a google image search, I saw some drawings of him where the stovepipe of the hat is almost straight, tapering near the center, widening greatly at the top. Other pics had the bend in the middle of the stovepipe. I'm assuming they want the bend. 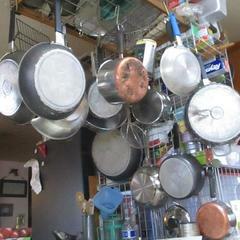 I would use 2-6" x3" rounds for the bottom part of the stovepipe. Carve the second 6" round on an angle, like you would a whimsical cake, then torte and fill it. It will be your middle layer. I would only go about 22 degrees from your fulcrum point (here I go with the geometry again), because you need to keep it as upright as possible, to support the top tier. The top tier would be a 7" or 8" x 2" contour, so that I would only have to carve the bottom of it to make the puffy feature at the top of his hat. 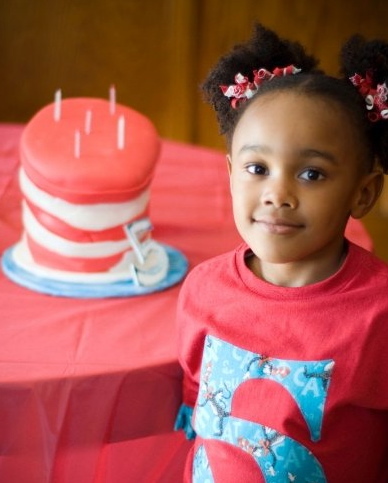 Cover it all with rolled fondant, or get out your airbrush and some painter's tape. For the ears, I would stick them between the crown and the brim of the hat, bending them the way his ears go. I looked at the mad hatter demo thread...thanks for the suggestion! and theresa, with the carving of the second cake, i understand that would be a good move...but would i carve from bottom to top or top to bottom? wouldn't that create two different angles? and the fulcrum...is that the center of the cake? as for carving the top cake, just kinda carve the sides into a type of "triangle? like shave off the sides at a downward angle? thanks for the suggestions, i'm going to try sketching like in the thread, and see if i can visualize it! Let's start with my terminology. A fulcrum, in this instance, is the pivot point, or the point where you will start carving. It doesn't matter if you want to start from the top or the bottom, because the size of the angle will determine how much it leans, not what end you start from. I would carve it from the top, to avoid having to level it. Important - refrigerate or freeze your cake for at least 30 minutes before carving. It will give you a sturdier structure to carve. If it starts getting too crumbly, refrigerate or freeze again. Allow to come to room temperature before applying rolled fondant, or you may get a blowout (air bubble), which can stretch or crack your fondant. If using a 6x3" round - Pick a side and measure to 2 to 2-1/4" from the bottom. Stick a toothpick there for reference. Carve from the top of the opposite side to just above the toothpick. The top of your carved cake should have a slight angle, which will then hold the top tier. The size of the angle is kept small so it can give the effect of the tilt without compromising the support of the top tier. For the top tier, I would use an 8" contour, then carve it more like a puffy chef's toque (the kind you see on the charicatures of chefs), attach it with some buttercream, then run a long dowel through the entire thing before frosting it. By the time you're done carving it, it will be small enough to match the top of his hat. Once assembled, you will have a little carving here and there, to smooth out the little ledges which will show up, because of size difference and angle. Boards and dowels between all tiers. Cut a hole in the boards which go between tier 1 and 2, and tier 2 and 3, so you can fit one big dowel through the whole thing. Insert the big dowel before decorating. Trim off the big dowel as needed. And to be honest, I would not torte and fill; I would leave it as it is and punch fill it. Punch fill is a term I use for filling a cake by punching holes in it with a star tip and a piping bag, and squeezing, like filling a cupcake. I start my punches 1 inch in from the side, 2 inches apart all around and inward. Not too much, or you'll crack the cake. Then I cut the serves like a sheet cake, about 2x2". If punched and cut correctly, each serve should have a dollop of filling in or near the middle. It looks great! Thanks for allowing me to participate in it's creation. Call on me any time.